This knowing, men will know (what is meant by) day and night. And then at nightfall they dissolve again, In (that same mystery) surnamed "Unmanifest." Satya or Krta (1,728,000 years): Satya means "truth"; the age is also known as Krta, "action," i.e., the age in which the people did unquestioningly what their benevolent elders told them. Treta (1,296,000 years): Treta means "three," the third age, counting backwards from the present: also the age in which the feelings and forces of good are as three parts, and those of evil as one; also the age in which people were specially "protected," trayate, by their elders. Dva-para (864,000 years): Dva-para means "two-sided," hence doubt also. Kali (432,000 years) which rotates in succession. Kali means "discord," "struggle". And all of these add to 4,320,000 years. Now, these four yugas, taken together, constitute one Mahayuga. One thousand Mahayugas are one day of Brahma. Brahma's one day is one Kalpa. 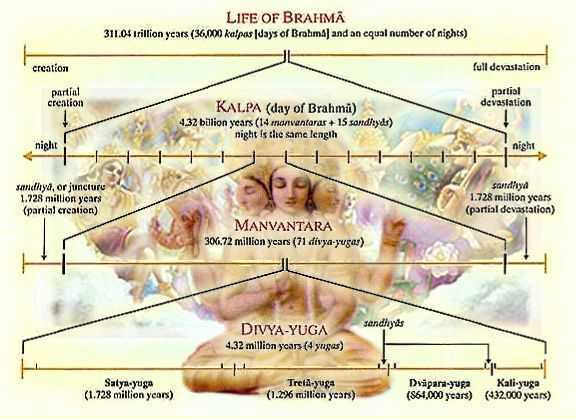 So one day of Brahma will be 432 crores or 4,320 million years or 4.32 billion years. A similar expanse of time will make His one night, and that is another Kalpa. Our wildest imagination staggers in conceiving Brahma's life-span. This is the expansive view of time. No other culture had this unique vision of the infinity of time as well as the infinity of space.